The most successful horror survival video game returns to toy shelves this Fall. This series is based on the latest version of the game, and includes the hero Leon Kennedy with an arsenal of weapons for slaying zombies and monsters alike. It also features Ada Wong, the beautiful yet deadly operative. The monster Verdugo, a towering alien killer with loads of articulation and a poseable tail and the frightening Chainsaw killer. 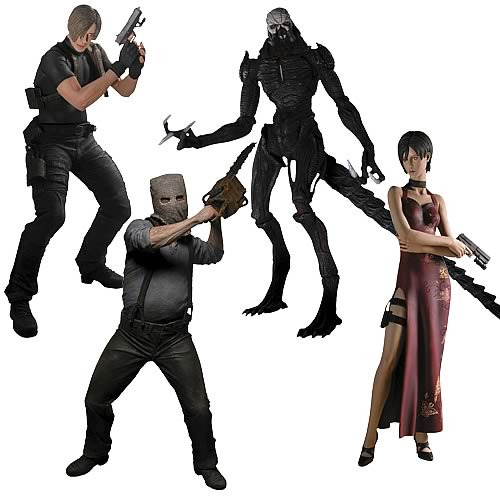 This series is based on the fourth major entry of the game series and includes: 2x Leon Kennedy (Shirt Version), 2x Leon Kennedy (Coat Version), 4x Ada Wong, 3x Verdugo, 3x Chainsaw Ganado. Each figure includes loads of articulation, weapons, and articulated pieces and come in clamshell packaging.